Gymnastics has traditionally not been a sport of strength for India. In this edition of the Commonwealth Games, India will look forward to their future star in gymnast Aruna Budda Reddy for a podium finish. The 22-year-old gymnast created history when she won India’s first medal at the World Cup of Gymnastics. The World Cup took place from the 22nd and 26th of February 2018 in Melbourne. For the Indian gymnasts, this was a test of their preparation level before the Commonwealth Games. The Indian gymnastics contingent at the CWG will not have their poster-girl Dipa Karmakar, who has been nursing an injury and is looking forward to the Asian Games. This Gold Coast edition of the Commonwealth Games will probably be the best chance for Aruna Budda Reddy to secure a podium finish, after having fallen short on numerous occasions at the world stage. At the World Cup, Aruna participated in the women's vault event and she did not disappoint this time. She amassed an average scored of 13.649 narrowly missing out on the silver medal to Emily Whitehead of Australia (13.699) and Tjasa Kysselef of Slovenia (13.800) who secured gold. 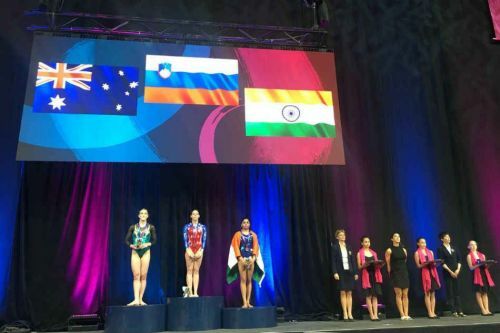 This was India’s first ever medal at the Gymnastics World Cup and it was Aruna’s stellar show that raises our hopes for a medal at the Tokyo Olympics in 2020. Aruna is currently 22, and is well-aware of the lifespan of gymnasts. Most gymnasts have a short career, starting as early as 15-16 years and ending by around 23-24. Aruna is at the peak of her powers currently and this year is probably her best shot at glory before she calls time on her career. India’s gymnastic contingent consists of seven representatives which also includes 2010 Commonwealth Games silver medalist Ashish Kumar. Aruna grew up in Hyderabad and at a very young age was introduced to gymnastics by her late father, B Narayana Reddy. Her coaches Swarnalatha and Ravinder are pretty confident that she will do well at Gold Coast. Later this year, her eyes will be fixed on the Asian Games at Jakarta, where she is expected to face stiff competition from the Chinese and Japanese. Can Aruna do it at the CWG? Aruna has been consistently participating at the World Championships after making her debut in 2013 at Antwerp. She followed that up with performances in Nanning in 2014 and Montreal in 2017, but on all occasions, she failed to progress beyond the qualifying rounds. If she can maintain her current form and remain free from injury, she could fancy a good showing at the CWG and Asian Games this year. Without Dipa Karmakar at the Commonwealth Games, India will look to Aruna’s performance for medals in Artistic Gymnastics. The 8th of April is when Aruna takes to the floor, and that is when we will find out whether she can win her maiden Commonwealth Games medal. Was McKayla Maroney's vault silver the biggest Olympic upset ever?